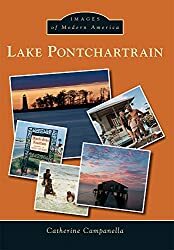 In 1938 a vehicular bridge was built over Bayou St. John, residential development of Lake Vista began, and Playland, Incorporated a well as Pontchartrain Beach moved to a 50 acres site in front of what was the town of Milneburg. The "Bug" was transported to the new location and used until the last day the beach was open to the public, Labor Day on September 5, 1983 (the park did open for reserved functions after that date). Harry's father, who died shortly after the move, told him, "You'll never make it. You put too much money into this" but it lasted 45 years until "the beach" closed in 1983. During the early days of the park at the end of Elysian Fields Avenue, Marguerite worked hard filling in at any positions which needed help. The family with two young sons, Harry Jr. and John, lived in town until Harry converted an old bathhouse into an apartment in which they lived for 22 years (until moving to Lake Terrace shortly before Harry retired in 1970) -- Marguerite said, "It was like living in a big, posh estate". Harry Jr. and John worked in the family business as boys, doing everything from manning the snowball shack to counting money. The first soccer match to be held in the Superdome pitted The New York Cosmos and the Dallas Tornado. The Brazilian star Pelé and Kyle Rote, Jr. led their respective teams on September 5, 1976. Earl K. Long, former Governor of Louisiana, died on September 5, 1960 at the age of 65 -- nine days after being elected to Congress . Long had gone to the hospital after polls closed on August 27, 1960. The amazing Big Mama Thornton performed a 9 P.M. show at the Dew Drop Inn at 2840 LaSalle Street on September 5, 1954 -- performing her hits Hound Dog, They Call Me Big Mama, and I Smell a Rat. Six white boys ages 14 and 15, described as being from "prominent families", were stopped by police at Hampson and Broadway at 9:30 P.M. on Saturday, September 5, 1954 for allegedly throwing water on Mrs. Clair Vacant of 933 Pine Street. Police had received complaints during the prior days of bike-riding boys throwing rocks and turning on outside home water faucets. One resident reported a broken store window shot out by a BB rifle. These private-school youths asked the officers if they may apologize for their actions, their request was granted, and they were released by police to their parents. Miss Harriet Mary Smither, daugher of Mr. And Mrs. James William Smither Jr.
Miss Gretchen Catherine Jahncke, daugher of Mr. And Mrs.Paul Frederic Jahncke Jr.
Miss Margorie R. Manger, daugher of Mr. And Mrs. Daniel Thomas Manger Jr.
Miss Harriett May Smither, daugher of Mr. And Mrs. James William Smither Jr.
Miss Peggy Jane White, daugher of Mr. And Mrs. Dudley Hearn White of Jackson, Mississippi, formerly of New Orleans. See Tulane University's Special Collections Division archive of the Reuter Seed Company Catalogues. September 5, 1954 -- Times-Picayune/New Orleans States.